On 31-12-2013 the year 2013 goes in Error. We're leaving another year behind, in the right setting and atmosphere, and more importantly with the right music. The techno room will provide full blown and straightforward techno, the kind of techno which is usually served on quality events as Kozzmozz and Area 51. Headliner is Ben Sims, one of the undisputed kings of techno, responsible for many labels of which the most well known, Theory, is up to its 40th release. He has remixed the likes of Jeff Mills, Adam Beyer and Chris Liebing and his album on Drumcode is highly ranked in the history books of techno. Next up, is Marcel Fengler, resident at the biggest techno institution in the world namely the renowned Berghain club in Berlin. His releases appear on their Ostgut Ton label as well as Luke Slater’s Mote-Evolver. These international slammers, will be joined by Kozzmozz residents Kr!z and Spacid and Area 51 residents Voxter & Balance. A New Year’s night filled with only the best underground techno around, let the party begin! Peep hosts the deep house room where the finest deep house sounds of the moment will be served fresh and excitingly. We are very happy to welcome an artist who played an influential role in the revival of house with Dixon, the man behind the leading Innervisions collective and label from Berlin. Together with Âme he brought house back into the limelight and many followed in their footsteps. Hailing from Amsterdam is Kabale und Liebe, responsible for various big house hits over the last years on labels as 100% Pure and Remote ànd one of the new bright stars of the Amsterdam’s New Skool scene. They will be accompanied by Belgium’s finest house talents: veteran Red D from We Play House and youngster Nathaniel from House Grand Cru Records. Bafana & Bromin from the Alpha and Quartz parties complete the house menu. To be devoured with lots of love and passion! 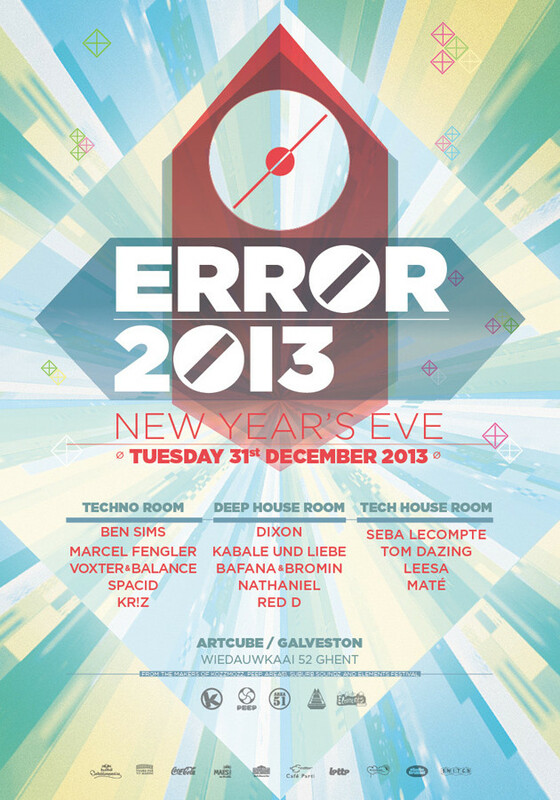 The tech-house room finally will be the place for a series of Belgian talents to show us the best they got. Seba Lecompte from the Bang the Box parties and Decadance will lead the way. Tom Dazing from Thrill Recordings and several German labels as Trapez and Monique music will keep up the pace and Leesa from Atmosphere Records and Maté from Nächtvogels will get you in the right mood. Upfront house and tech house beats with sometimes a minimal or techno twist that will keep you moving all night long, is what you can expect here! As you can see Error 2013 only brings the very best and this in three different genres so there’s something for everybody’s taste and different flavors for those who like many genres. As you probably know the organizers, you also know you can expect an outstanding production with all the extra’s that you should expect on such a special night!